I believe that Daniel Heller 222 has the accurate place of birth. His father did not arrive in America until 1738 and there is no record of his mother ever immigrating to America. I am a Linville descendant, so I especially appreciate your contributions to that family tree. So far, I haven't found any direct connections between your contributions and my ancestors, but I'm still hoping for that missing link to fall into place! For more information, contact Doug or Alison with any questions. Michael, congratulations on joining the Wednesday Watch Dogs. I was a one of them until recently (health issues). Thank you for all you are doing for WikiTree. We have a Gold Rush subproject under Westward Ho! that this would be perfect for! Thank you Michael for all your great work. I only hope I can learn to be somewhere as good as you in the future. Michael - I've noticed your contributions on WikiTree and wanted to see if you have any interest in Gateway Ancestors or the Magna Carta. Have you seen what we are up to at our Magna Carta Base Camp? Building well sourced trails from Gateways to surety barons. Let me know if you may be interested. Thanks for considering! 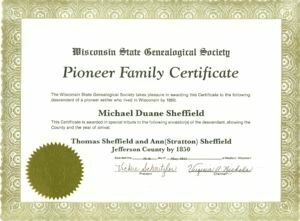 Hi Michael, Thanks for all your work on our family tree. Looks like you have located a copy of the Sheffield, Davison, Robinson family book which has a lot of Burrell info and pictures. Great to have this on Wikitree. We have some updates that may help. Thanks Michael for all the work you do on WikiTree for our Burrell, Sheffield,Davison family. I hope to add lots of pictures this winter. Sorry for the delay. I stumbled across your profile of Thomas Sheffield today, and am very impressed with your research and the way you present it. You may find the Profile of the Week Project interesting. We are really happy that you took the Pre-1700 certification Quiz. Thank you for doing your part to make WikiTree an accurate and openly collaborative place for genealogists to share their research. Do you have some 1700's people in your tree already ? Now that you have the badge, you can take part in one of our historical projects. If you have any questions, you can contact one of our Mentors or Volunteer Coordinator, Erin . Michael, thank you for your work on the Crim tree. It has helped me tremendously. Michael is 42 degrees from Graham Chapman, 25 degrees from Janet Wild and 18 degrees from Henry VIII of England on our single family tree. Login to find your connection.